I purchased this plant from Home Depot where it was labeled 6" tropical. I recognized as an Anthurium but had absolutely no idea which. 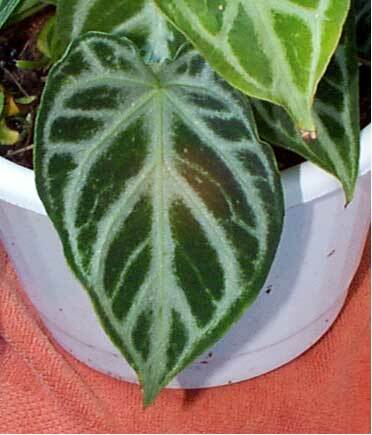 I contacted a few people in Aroid listserver and was advised that it was probably Anthurium "Crystal Hope" which is a small Anthurium clarinervium. Besides a size difference, the greatest difference between this and clarinervium is the texture of the leaves. Those of clarinervium have a little more substance and are longer. This leaf is slightly thinner and the leaves are relatively wider. It's also a short plant. The leaf depicted is one of the largest. I would have included a photo of the whole plant but just spent some time pruning and before I knew it left far too many holes. Repotted and ready for some blistering heat in the next few days, I expect the plant to recover well. I can't complain for the $6.95 Home Depot charged me.